Utah Valley University received a B.
Washington Monthly's ranking of 111 out of 346 of Baccalaureate Colleges - Overall Rank was a major contributor to this grade. 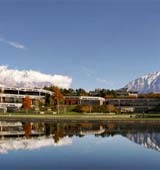 Utah Valley University is college with 30370 students located in Orem, UT. Describe the type of student who should not attend Utah Valley University and explain why. Describe the type of student who should attend Utah Valley University. Why? What is a typical Utah Valley University student like? Describe the type of person that should attend Utah Valley University. The typical student at Utah Valley University should like the snow in winter time and a dry summer, working hard but still having fun with their peers in all of the different activities that are part of campus life. What are the top 3 reasons someone should attend Utah Valley University? What was a typical Utah Valley University student like in high school? Describe the type of person that should attend Utah Valley University. UVU is a teaching institution where students learn, do and become. At UVU, the fusion of academic and hands-on learning is referred to as "engaged learning." Along with the institution's long-rooted commitment to serving the needs of the community, UVU's emphasis on engaged learning led to its classification as "community engaged" by the Carnegie Foundation. UVU's Grants for Engaged Learning Office oversees a $400,000 grant program in support of engaged learning projects. At UVU, students participate in internships, community service and curriculum that includes the "how" along with the "what" and "why." What are the top 3 things that students do for fun at Utah Valley University? 17% of students graduated in the top quarter of their class. The average student pays $9,122 for tuition, fees, and other expenses, after grants and scholarships. Total stated tuition is $4,368, in-state and on-campus, before financial aid. Learn more about financial aid at http://www.uvu.edu/financialaid/. Estimate the net price for you at http://www.collegeportraits.org/ut/uvu/estimator/agree. The typical (median) early career salary of Utah Valley University graduates is $42,000, according to Payscale. Utah Valley University participates in the NCAA Division I-AAA for college athletics. Want more info about Utah Valley University? Get free advice from education experts and Noodle community members.